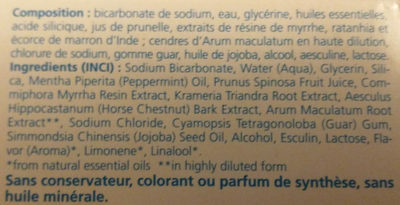 Sodium Bicarbonate, Water (Aqua), Glycerin, Silica, Mentha Piperita (Peppermint) Oil, Prunus Spinosa Fruit Juice, Commiphora Myrrha Resin Extract, Krameria Triandra Root Extract, Aesculus Hippocastanum (Horse Chestnut) Bark Extract, Arum Maculatum Root Extract, Sodium Chloride, Cyamopsis Tetragonoloba (Guar) Gum, Simmondsia Chinensis (Jojoba) Seed Oil, Alcohol, Esculin, Lactose, Flavor (Aroma), Limonene, Linalool. Product added on May 28, 2016 at 10:21:22 PM CEST by jpguerard. Last edit of product page on November 29, 2018 at 9:19:37 PM CET by sebleouf. Product page also edited by openfoodfacts-contributors, tib-de-bar.